Hundreds of people came to St Mary's University College on February 8th to raise the ghost of Winston Churchill exactly 100 years after his visit to the Falls Road. A packed house heard eminent historian Dr. Eamon Phoenix brilliantly sketch the history of the day when the Liberal MP, who served as First Lord of the Admiralty in the Cabinet, having accepted the invitation of the Ulster Liberal Association, came to speak in support of Irish Home Rule. 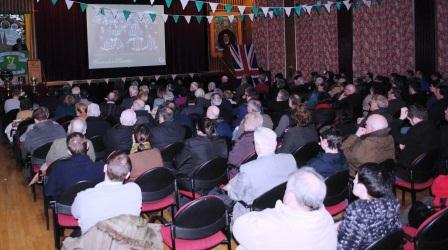 A fascinated crowd also listened as Belfast Celtic Society chairman, Padraig Coyle relived the drama of the sporting season in 1912 in which several league clubs broke away from the Irish Football Association and organised their own competition – the Gold Cup. Celtic defeated Glentoran 2-0 to become the first winners of the trophy before peace was restored and the clubs rejoined the league. 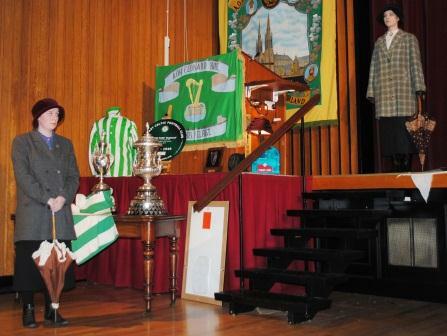 Also that year Celtic's reserve team captured the Steel and Sons Cup for good measure. Former Belfast Celtic Society Secretary, Frank Hennessey, Chaired the meeting and staff at St Mary's were at hand at all times to ensure its smooth running. The gathering was opened by the Minister for Arts and Culture, Carál Ní Chuilín MLA, who reflected on her position that the series of up-coming 'centenaries', of which the Churchill celebration is the first, be hosted in a spirit of inclusiveness. Her Executive colleague, Ulster Unionist Danny Kennedy MLA, listened intently and also added to the debate on the night with his own views of both the commemorative process and his family history, including his Grandfather's signing of the Solemn League and Covenenant, which also happened in 1912. 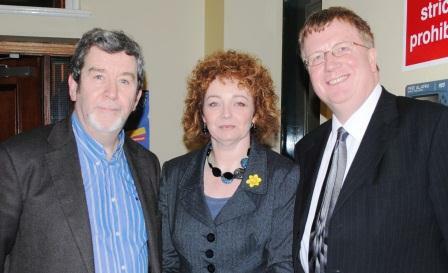 Belfast Celtic Society Chairman Padraig Coyle (left) with Minister for Arts and Culture, Carál Ní Chuilín MLA and former Belfast Celtic Secretary Frank Hennessey. 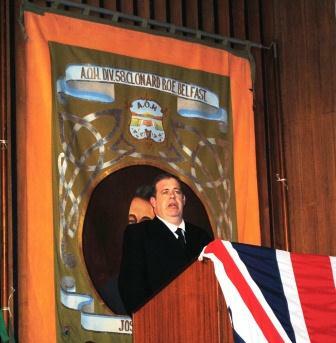 Actor Alan McKee stole the show as he performed the role of Winston Churchill in the drama Home Rule?, brilliantly reprising the address which was given on that wet winter's day at Celtic Park on Belfast's Donegall Road.The critical speech was brightened by several instances of humour including the spilling of some nuts and bolts spilt on the stage as Churchill lauded his introduction to 'Belfast confetti' as his motorcade came under a hail of metal as it made its way along Royal Avenue. Mrs Sadie McArdle (Hannah Coyle) and Miss Jocelyn Wilding (Anna McKiernan) brought the cause of the suffragette movement into the spotlight as they defiantly heckled the First Lord of the Admiralty from the floor, making sure Votes for Women was most definitely on the agenda. Former leader of the Progressive Unionist party , Dawn Purvis, who is now chair of the organisation Healing Through Remembering, was joined by Eamon Phoenix and Dr Brian Feeney, head of history at St Mary's University College for a panel discussion which was chaired by Padraig Coyle. Contributions from the audience came from former moderator of the Presbyterian Church in Ireland , Dr John Dunlop, the Reverend Dr David Lapsley as well as author Barry Flynn. Other attendees included senior Belfast republican Sean Murray, Maire Hendron from the Alliance party, the SDLP's Alban Maginness and Patrick Nelson, Michael Boyd, Maria Wilson and Lisa Rickett from the Irish Football Association . Kate Turner director of Healing Through Remembering was also present. Families of several Belfast Celtic players, including the children and grandchildren of Bertie Fulton and Walter Bruce were also in attendance. Society Chairperson Padraig Coyle believes that this was one of the most important events ever undertaken by the Belfast Celtic Society. 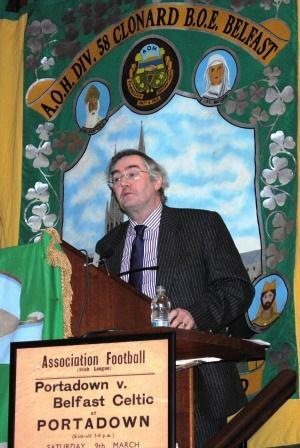 "The Belfast Celtic Society extends its deepest thanks to Professor Peter Finn and all the staff of St Mary's College for making the society and its guests so welcome, to Belfast City Council for its generous contribution to our costs and to the Clonard branch of the Ancient Order of Hibernians for kindly lending us some banners and flags." "Thanks too must go to the Irish FA and both Glentoran and Bangor football clubs for allowing us to display the Irish Cup, Gold Cup and the Steel & Sons Cup. Hopefully we can have many more evenings as successful as this one."